Belgium is a small country located between France and the Netherlands. Although it is relatively unknown to international tourists, Belgium has some of the most interesting towns and villages in all of Europe. The historic community of Bruges (Brugge), for example, is a gorgeous Gothic town that in the 11th century, was larger than London England. 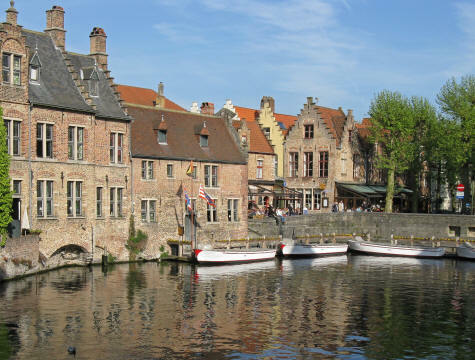 The nearby city of Gent (Ghent) is also very appealing and certainly worth a visit. The capital city of Belgium is Brussels. In addition to being the national capital, Brussels is home to the European Union Parliament. Visitors can take a tour of the EU headquarters and learn how the political union functions. The city of Antwerp is located between Brussels and the Netherlands. Its claim-to-fame is diamond cutting. Diamonds are imported from around the where and are cut into precious stones in Antwerp. Two languages are spoken in Belgium: Flemish in the north and French in the south. Travelflicks is please to provide four travel guides of Belgium. Access them from the menu.